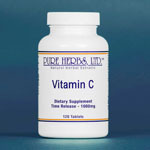 Vitamin C - Helps the body to metabolize fats and proteins. Helps in the maintenance of bones, cartilage, teeth and gums. Helps to support healthy connective tissue. Beneficial for the maintenance of good health.